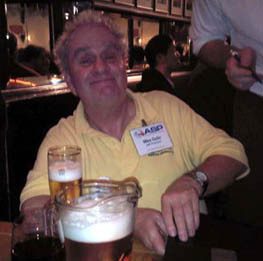 I was very sad to read in the ASP forums at the weekend of the death of ASP President, Mike Dulin. Mike and I crossed paths a number of times. I met him several times at ESWC and SIC events, often listened to his Shareware Radio podcasts, interviewed him for this blog and exchanged quite a few emails related to the Shareware is dead – long live Shareware! article I wrote recently for the ASP blog. I spoke to him by Skype only a few weeks ago. Despite long term health problems, Mike devoted considerable time and energy to the ASP and it was under his leadership that the ASP finally managed to drop the word ‘shareware’ from its name. Mike was a colourful character and his energy, gravelly voice and sense of humour will be sorely missed in the ASP and at industry events. This entry was posted in news, software and tagged asp, mike dulin on 2 August 2010 by Andy Brice.